Virtually every slots developer worth its salt has brought out an online slot based in the romance and spirit of Africa: from Ainsworth's Safari Spirit slot to Betsoft Gaming's cracking 3D online slot, Safari Sam, if you want exotic sunsets and giraffes, you got it. 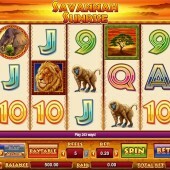 Slots developer Cryptologic is the latest developer to get their designer loading up the oranges and reds in his color palette ready to let rip with their Savannah Sunrise slot. I won't lie, I've seen this theme a dozen or so times in slots and I've not really added any of them to my favorites collection. However, I am always willing to play a new slot with an open mind and did not want to condemn this one to the mediocrity pile just quite yet. Pick 1 to 5 Reels to Play! Where this slot differs is in the reels and pay-lines. The game - like some Cryptologic and Microgaming slots - uses the 243-ways-to-win format. But instead of just letting it ride across all reels you get to pick 1 to 5 reels to play (although if you deselect a certain reel, the middle spot is still active). If that sounds pretty juicy, look at the coin bets, which range massively from $0.01 to $20 a spin. As you'd expect, the reels are full of beautifully-rendered icons straight from an African safari: a Lion, the elephant, a giraffe, a zebra, and a monkey. Some regular 9-through-Ace symbols make up the numbers. The elephant is the top payer, and a great 5,000-coin jackpot can be won if you hit five elephants across the reels. The Lion - as is the case in all safari-themed slots online, it seems - is the game's Wild, and substitutes for all regular symbols in the game other than the Scatter. It only appears on Reels 2 and 4, so it hardly has the loudest roar in the world. The Scattered Flame Tree icon triggers a free spins bonus round when you hit three or more on the reels L-R. You will win 20 free spins, but the multiplier increases if you use Wilds within your winning combos. So, for example, hitting a Wild Lion on Reel 2 during free spins will treble your win; hitting a Wild Lion on Reel 4 will multiply it by five, and hitting Wilds on Reels 2 and 4 at the same time during free spins multiplies your win by 15! The ability to choose your reels is a neat touch and something I've not encountered yet. 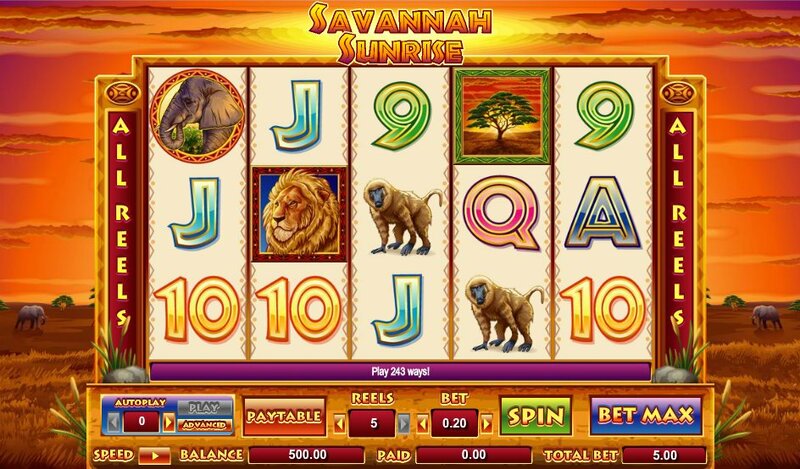 It certainly puts Savannah Sunrise above other safari-themed slots out there right now, and with Cryptologic's powerful software and slick design in place, together with a potentially lucrative free spins round, this is a slot I think you should hunt out.